Dainese Neck Gaitor. Machine washable. Neck Gaitor. Can't find what you're looking for?. Sizing Guide. Machine washable. Size Guide. MOTORBIKES & SCOOTERS. Dainese Protective Clothing. Dainese Casual Wear. Ducati Protective Clothing. Kids Collection. Ladies Casual Wear. Gents Casual Wear. Moto Central: Dainese Volund 07 Balaclava. Ergonomic Fit. Moto Central: Dainese D-Core Balaclava. Seamless Build For Superior Comfort. Maximum Aereation. Made In Italy. Moto Central: Dainese Silk Balaclava. One size fits all. back to top 1673975. Stretch Balaclava 100% pure silk. 23018 Talamona (SO). Marke Dainese. For this we are: Smooth and easy processing, you can benefit from our excellent service. He has einenhilft to the neck warm in cold weather. EAN 8033431932840. Switzerland → 30, - EUR. Marke Dainese. He has a printed seam at the ends and is stretchable. For this we are: Smooth and easy processing, you can benefit from our excellent service. 96% Polyester, 4% Elastane. Material Polyester. Dainese balaclava Seta. The ergonomic cut Balaclava of Seta by Dainese is 100% soft silk. Marke Dainese. For this we are: Smooth and easy processing, you can benefit from our excellent service. Switzerland → 30, - EUR. Marke Dainese. ergonomic cut. TOP quality. Material Polyester. Material GORE-TEX. Material Elasthan. Farbe Schwarz. EAN Nicht zutreffend. Dainese Balaclava 100% silk 1995920. Marke Dainese. Classic balaclava for each temperature range. Features: soft, supple, thermally ideal. very easy to care for and washable. Material Seide. Farbe Schwarz. Dainese Balaclava total WS Evo. Marke Dainese. For this we are: Smooth and easy processing, you can benefit from our excellent service. ergonomic cut. 100% POLYESTER. Switzerland → 30, - EUR. (no free option). Dainese Leg Bag.. Stickers, Graphic Kits, Custom. 1 - READ CAREFULLY ALL THE AD TO AVOID MISTAKES AND MISUNDERSTANDINGS. Color: Black. ANY DELAY CANNOT BE ATTRIBUTED TO US. ORDER BY PHONE- 095 504632 ________________________________________. Dainese 1915952 D-CORE BALACLAVA black Balaclava. Dainese D-CORE BALACLAVA hood. Marke Dainese. Saison Motorradbekleidung. Material Dryarn®, Polyamide, Elastane. Farbe Schwarz. EAN Nicht zutreffend. Größe Einheitsgröße. 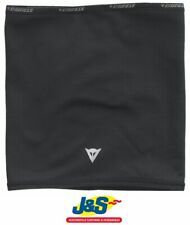 Dainese 1994060 scarf foulard PT black. Inspired by people, since 1972. Dainese logo. Marke Dainese. 100% Cotton. Material Baumwolle. Farbe Schwarz. Dainese 1875786 zip belt Verlängerungszip black. Extension fitting for Dainese motorcycle jackets. Marke Dainese. This extension is using the connection - zip fastened to the jacket. EAN Nicht zutreffend. ANY DELAY CANNOT BE ATTRIBUTED TO US. Color: Black.. Stickers, Graphic Kits, Custom. GENERAL FEATURES. EAN 8052644195040. Long and high quality balaclava by Dainese. We go above and beyond to ensure you receive the best level of service. Item model number 1996219. Manufacturer Part Number 1996219_001_L. Item Weight 181 g.